March 27, 2014 (Tokyo, Japan) - Japan Display Inc. (President and CEO: Shuichi Otsuka; JDI), a global leader in mobile display technologies, announced that it has developed a wide Quad HD (hereinafter “WQHD”) format with a resolution of 1,440 horizontal pixels x 2,560 vertical pixels as a display format for leading-edge smartphones*1 and that it is now ready to begin volume production of WQHD products and will commence shipping 5.5-inch WQHD TFT liquid crystal display modules in coming April. The camera device and image processing technologies incorporated in smartphones are becoming increasingly sophisticated with every day. It is now possible to enjoy high quality images on large displays in excess of 5-inches. The product in question boasts a world-class screen resolution of 538 ppi among the volume production products. It reproduces photo images and videos more realistically than in the Full-HD format with a resolution of 1,080 horizontal pixels x 1,920 vertical pixels on smartphone displays. *2 With this product as a starter, JDI will be releasing a number of WQHD products in 2014 and it is anticipated that a new leading-edge range will emerge in the smartphone sector. This product adopts JDI's enhanced low-temperature poly-silicon (LTPS) technology, which helps improve the pixel aperture ratio to achieve high transmittance and low power consumption. Meanwhile, it retains the thinness and compactness of the conventional Full-HD TFT liquid crystal display modules. *1 JDI's news release on October 24, 2013, "Japan Display Inc. 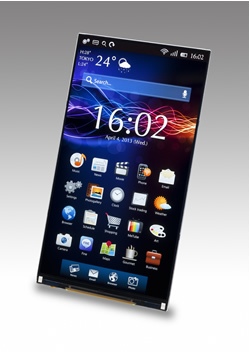 Announces Development of 5.4-inch WQHD TFT LCD Module"
*2 Resolution density of 5.5-inch Full-HD is 401ppi.